The 2019 edition of the Six Nations Under-20s Championship will get underway with Friday night fixtures in Ireland and Scotland on Friday 1 February. The Championship will open with the meeting of Ireland and England at Irish Independent Park in Cork, shortly before Scotland face Italy at Gala RFC on the same evening. France, the reigning World and Six Nations Under-20s champions, will begin their title defence against Wales in Vannes on Sunday, February 3. 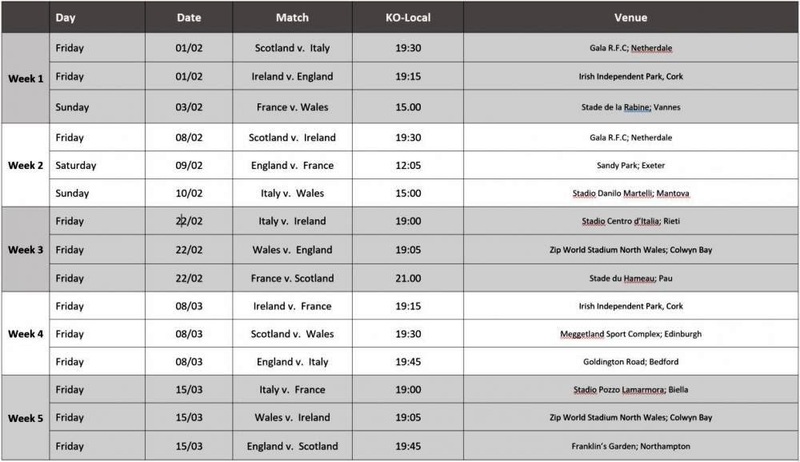 A second Friday night fixture for the Scots will open Round Two with Ireland making the trip to Netherdale this time. The Under-20 edition of Le Crunch comes next with England hosting France at Sandy Park Exeter. England finished second in last year’s Championship on points difference and both sides will know that this clash is potentially crucial to the destination of the 2019 title. Italy, fourth in 2018, will face fifth place finishers Wales in a Sunday fixture in Mantova. The sides will then have a gap week before Round Three. All three matches take place on Friday night for this one with France v Scotland (Pau), Wales v England (Colwyn Bay) and Italy v Ireland (Rieti) lined up. The final two Rounds will also feature trios of Friday night fixtures with the Championship set to visit Edinburgh, Bedford, Cork, Biella, Colwyn Bay and Northampton over two weekends in March. Last year’s Championship proved hugely competitive with all six sides winning at least one match before France claimed the title with a nail-biting bonus-point win over Wales on the final day. With all six sides set to be boosted by graduates from April’s Under-18 Six Nations Festival, won by Scotland, this year’s Championship looks side to provide another dose of the thrilling attacking rugby for which the Under-20s Six Nations is renowned.